McMillan recently merged with the law firm of Lang Michener to form one of the largest Canadian law firms with offices in Vancouver, Calgary, Toronto, Ottawa, Montréal and Hong Kong. The firm is positioned to provide enhanced and expanded services to clients across Canada and in the critical growth markets of Asia in key industry sectors, including mining, forest products, oil and gas, financial services, transportation, technology and communications, manufacturing, automotive and more. One of the firm's specialty practices is the Supreme Court Group, led by Eugene Meehan, which specializes in taking high profile, procedurally complex and strategically challenging cases to the Supreme Court of Canada where the firm can act either as agent or counsel. 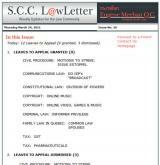 The Supreme Court Group uses our email marketing software to publish weekly email newsletters on new Supreme Court cases in both English and French.